The storm of Brexit has shaken British politics to its roots in the past nine months. The extent of the damage to people’s jobs and livelihoods is yet to be seen but already the depreciation of sterling has led to an increase in prices and the flight of jobs to the continent has started. There has been much comment on the fissures in Labour’s traditional electoral coalition in the aftermath of the Brexit vote. But Labour is a great party with a great history. We are the only party in Britain that can craft a positive future for all out of all this and rebuild our divided nation. The referendum and the triggering of article 50 to implement the result represents the first stage in our withdrawal from the European Union. Giving the government the right to start the negotiations doesn’t mean that they have a blank cheque on the outcome – the British people didn’t vote to make themselves poorer in the process. The next stage is the negotiation of a deal with our EU partners and the passage of associated legislation. But before we move forward – as the article 50 Bill completes its course through both houses of parliament – Labour must bust a few myths and separate fact from fiction with regard to what has happened since 23 June 2016. The first myth is that parliament would have stopped Brexit after the Brexit vote, having been given responsibility for triggering article 50 by the Supreme Court. That was never going to happen and any claim to the contrary is, frankly, a lie. Those of us who passionately and energetically campaigned to Remain could have stopped Brexit if we had won that referendum last year but we lost – we failed to persuade a majority of the British people that membership of the European Union was in Britain’s interests. It was clear following that referendum result that there was a majority in the house of commons to implement it. For the commons to do otherwise would have alienated over 17 million voters, many of them Labour, who chose in good faith to leave the EU; it would also not have impressed the millions of Remain voters – more than half – who have since told pollsters they accept the result, even if they do not like it, and believe the country should move on. Labour, a national party seeking to represent the entire nation – not half of it – has recognised this, hence the decision not to vote against Article 50. How individual MPs chose to interpret the result and what they did given their constituency vote was an individual choice which I respect, but the decision of the party nationally was the right one. However, a group of opportunists leading other parties has chosen to attack our national party for making this tough decision. The rank hypocrisy and opportunism of the Green, Liberal Democrat and SNP leaderships during the passage of the Article 50 Bill is unedifying and we must expose them. Both the Greens and Lib Dems have attacked Labour for voting to implement the result of a national referendum – a referendum they had previously campaigned for. They had both been calling for the EU referendum, which led to the Brexit vote; we had not. Some leading figures in both the Greens and Lib Dems – notably Baroness Jenny Jones, Sir Vince Cable, Norman Lamb, and a few others – recognise this and have adopted a more responsible position; their leaderships have not. The SNP of course seek to use the post referendum landscape for one purpose and one purpose only: to divide the UK and agitate for yet another referendum on independence. In this the SNP didn’t need much persuasion given the Tories have spent the last two years jeopardising our union not least with a divisive and irresponsible 2015 general election campaign pitting England against Scotland. We should leave the opportunism and hypocrisy to these parties – it is not the way for Labour to unite our country. The second myth is that Labour, working with others, could have overturned the Tory majority in the House of Commons and forced the Government to accept the amendments tabled to the Article 50 Bill. Our frontbench and others including myself, Harriet Harman, Chris Leslie, Heidi Alexander, Mary Creagh and Ian Murray tabled amendments respectively on the NHS, EU citizens’ rights, single market membership, the environment and to ensure devolved administrations are properly consulted. For this to happen would have required a substantial Tory rebellion given they not only have their majority in the Commons but the support of the DUP. Again, even the strongest Remain Tories made it clear they would not rebel in sufficient numbers for this to have any real hope of happening. The only concessions we managed to secure to the article 50 bill were the publication of the white paper and further moves towards a vote on the final deal. But I did not put down my amendment seeking to force the PM to set out how she would make good on her cabinet ministers’ promise (paraded around on their big red bus) to put £350m extra per week into the NHS in the expectation that she would agree to it. We all tabled our amendments primarily to make the arguments and put down a markers that Labour can return to at the 2020 General Election to illustrate the way the Tories break their promises. This does not mean the parliamentary debate on Article 50 has not been valuable but lets not pretend, now it is over, the job of opposing a hard Brexit starts and finishes with that Bill. What it has done is set the scene for the second part of this process – the deal we reach with our EU partners. When people ask, is Labour not simply aiding and abetting a hard Brexit? I say no: the negotiation has not even started and, as our deputy leader Tom Watson said yesterday, it is what we do now in relation to the deal that matters. As we move on from article 50 Labour needs a much clearer message setting out how we respect the result but will fight a hard Brexit (better referred to as the simple “destruction of jobs and livelihoods” – who talks about a hard Brexit outside the Westminster bubble?). Many of the 16 million who voted Remain recognise the two myths I set out above and are under no illusions that the Brexit vote can be reversed, but want to see Labour fighting more strongly for the values – the messages of hope and unity, over fear and division – that underpinned the Remain campaign. There are plenty of opportunities over the next two years to do just that in the great repeal bill, the finance bills implementing forthcoming budgets in parliament. Outside of parliament we must campaign in the media, on the streets in our communities and in our workplaces (where our trade unions have a key role) to get the messages across. And let there be no ambiguity in what we say about the Tories: Theresa May’s strings are being pulled by the extreme Brexiteers in her party – they are the ones in charge, and they have dictated the course she is set on. As negotiations get underway, both the flaws in the government’s approach and the lies of those Tory Brexit campaigners must be exposed. We should set a high bar for the government to clear for their negotiation to be a success. So, on the economy we must hold David Davis to his pledge that the government will get a trade deal with Europe that delivers “the exact same benefits” as that which we enjoy today, and keep fighting for British membership of the single market and customs union to protect jobs. On immigration, the rights of EU citizens living in our country have to be guaranteed, and Brits – young and old – must be given the skills to reduce our economy’s need for immigrant workers. Brexit must deliver greater resources for our public services, and especially the NHS – as Vote Leave Watch (which I chair) has argued, we cannot afford to allow Leave campaigners in government to wriggle out of responsibility for that £350m a extra per week promise. And overall, the deal must be in our country’s interests, retaining close cooperation with the EU on protecting workers’ rights and our environment, and fighting organised crime and terrorism. The prime minister says “no deal for Britain is better than a bad deal for Britain” as if she will bear no responsibility for such an outcome. The most contentious part of the negotiation – before any trade arrangement is agreed on – will be the price of the EU divorce settlement. The Tories – both Tory Remainers and Leavers – said before holding the referendum, in part to justify the risks of holding one, that if the UK voted for Brexit they would secure a cut price divorce settlement because of the desire of, for example, Germany to sell its cars here. They will try to scapegoat our EU partners and the civil service if their negotiation goes wrong, the divorce price tag is too high, and all we can get is a “bad deal” with the European Union. It is our job to ensure the PM and her party are the ones held responsible for this. The route to back to government, so we can deliver on Labour’s values, starts with providing an effective opposition. With sufficient clarity and the right message, there is no reason why we cannot take these Tories apart for what they are doing to our country on Brexit. Let’s stop making excuses and get on with it. 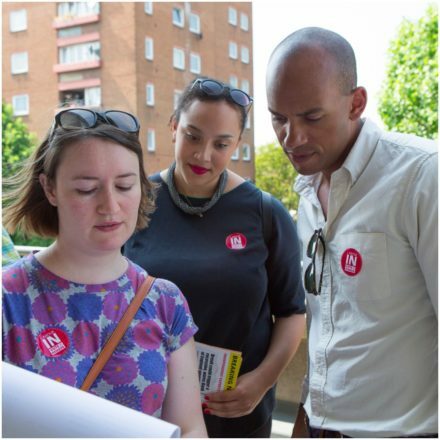 Chuka Umunna led the Labour In For Britain campaign in Greater London and was Labour’s Shadow Business Secretary from 2011-2015. He is the Labour MP for Streatham.